Roused by Lute, She Wakes – works for the lute performed by Andrew Maginley. The Centaur’s Curse – The tale of a woman with child who seeks safety by relinquishing her femininity. 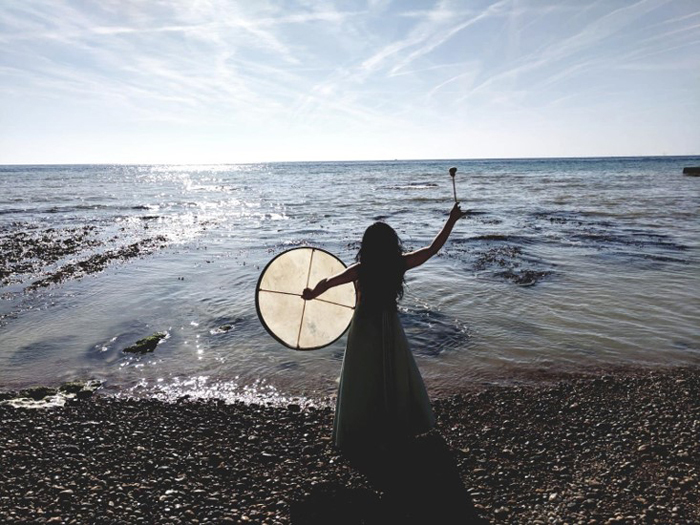 The Northern Siren – A fatal romance of sea, sky and siren song; narrated by voices, double bass and percussion. ROSIE MOON: Rosie works with many period instrument ensembles in the UK and abroad, including Florilegium, The Orchestra of the Age of Enlightenment, Ensemble Cantantio and The Oxford Bach Soloists. She has recorded with Camerata Alma Viva and The International Baroque Players. Rosie has also broadcast live on BBC Radio 3’s ‘In Tune’ with various groups, and has worked as principal bass under Haitink, Esa-Pekka Salonen, Sir Charles Mackerrs, John Wilson and Sir Roger Norrington. Rosie studied modern and baroque double bass at The Royal College of Music (with Peter Buckoke) and a Performance Masters in Geneva at The Haute Ecole de Musique (with Alberto Bocini). ELEANOR CONLAN: Eleanor is a puppeteer, writer and costume maker. She has an MA in Shakespeare and Early Modern Drama and trained at Shakespeare’s Globe. Eleanor established Rust & Stardust, a puppet theatre company, with Katie Sommers. Plays include The Wild Man of Orford, Three Ribbons, Turning Leaves, A Winter Journey, Dr Dee’s Daughter & The Philosopher’s Stone, The Green Children of Woolpit and Black Shuck. Eleanor is also a storyteller and costume designer.